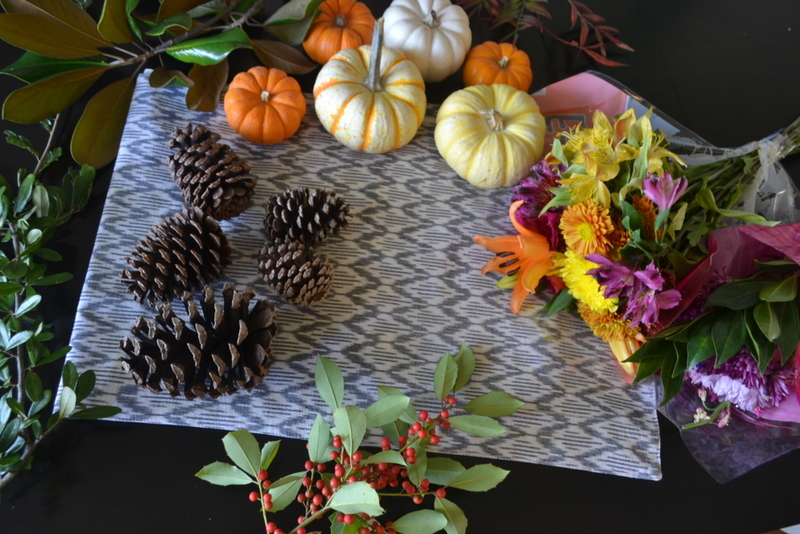 With Thanksgiving in just a couple days I thought I would share an easy, DIY centerpiece to dress up your table. This centerpiece can be done with little cost. With the exception of the flowers that cost me $20, I used what I had at the house or could find outside. First decide on the color palette you want. I wanted to add a bit more color than what you would normally associate Thanksgiving with. I found a couple bouquets at the grocery store that had a combination of orange, yellows, pinks and purples. Next, decide how many arrangements you want. Since my table is pretty long I decided to do two. Place the runner down and position your vases. I then started laying the branches, starting from left to right. I flipped some of the Magnolia branches face down so more of the brown underside would show. Once my "garland" was complete, I moved on to the vases. I divided up the flower bouquets to make two similar arrangements. Working in a circular pattern, I started with the taller leafy pieces in the back and the brighter pink flowers upfront. Once I was happy with the arrangements, I added my filler (pumpkins, oranges, pinecones, and brass accents) to my garland. There you have it! Easy-peasy and with little cost. I encourage you to take inventory of what you already have at home. For filler alternatives, you can use a variety of produce- apples, grapes, lemons, artichokes, pretty purple cabbage. Anything really that has some contrast to your clippings. Here I added candlesticks but I think I prefer it without them. Hope you all have a wonderful Thanksgiving!